hi, read all your very nice pics and stories, you know, you should not just be photographers, you should all be writers too! i got many parents asking me where the webpage is, i sent the link but I myself cannot access thru that link, can you pls send me the link to my email address? Short but straight from the heart of a mother, who may have little or no knowledge of computer camera etc., the feeling of being so blessed by this activity is none the lesser! What can we say, except, again, "MARAMING SALAMAT PO"
yesterday, a picture of Kara with Malen & Jason was posted on the front page of a local chinese newspaper - world news, with a caption of zoo visit of blind children, courtesy of AP. Today, Bulletin had a picture of Czarinah w/ 2 parrots, with same caption, courtesy of AP. Today, Philstar had on its front page picture of Eugemar & Czarinah, with birds (with the wrong caption though . Yes, the parents will not be able to see the link "Events" under "Share A Photo" section where this thread "A Special Day for Special Children at Manila Zoo" is located unless they register to this site. I tried to logout to test how this website is configured for non-registrants and I've confirmed that "Events" section is not available. Maybe the website Global moderators (one of them is Mike or pubert) can give further information about this matter but i suggest that you encourage them to register for the purpose of accessing the said link. Hello Ma'am Linda. I think they would have to sign up in the forum, then log-in to be able to view this thread? Can somebody confirm this please (EDIT: confirmed, by Sir Orlee's post above). Thanks! For those who don't have ready access to the internet, kindly tell them that in the next few days, more prints and photo-CD's will be sent by us, either thru courier or thru Sir John. Thanks and regards to everyone! I've noticed that Eugemar is wearing a special watch... a talking watch for him to know the time of the day. Im wondering if it is important for him to know the difference between a day and a night (except for the night we all used to sleep) since he is deprived of seeing the light. In photography, without light there could be no vision or photography because it is light reflected from the world around us that makes things visible to both our eyes and the eye of the camera. Im saddened to know that Eugemar will not be able to aspire to become a photographer like many of us since the real meaning of photography is writing or drawing with light. He was introduced not only the living zoo animals but also the animal stuff toys. He was also privileged to feed the largest and most famous zoo animal "Mali". I have sent in 3 posts but they got lost, anyone seen them? :For me as jason's mother, masaya po ako na nbigyan ng pgkakataon ang mga ngagawa ng ibang batang nkakakita, at s inyong mga photography mraming salamat po pinasaya nyo any mga bata, GOD BLESS." Simply said, but straight from her heart, and from all of us. Today, Philstar had on its front page picture of Eugemar & Czarinah, with birds (with the wrong caption though Grin Grin. This was not Edelyn's visit at the zoo, she had been here several times, but also according to her, this was the closest she can get to interact with the animals, also the first time she had touched them. yesterday there was a concern that we should get the consent of the parents for us to post their children's pictures. Well, happy to inform you, all gave their consent, either by text or when we met yesterday when we sent our children to summer camp. I just want to add a little bit.Retina of the eye is equivalent of film of the camera. ROP is blind due to the detachment of the retina - a camera without films. Remember the reason why you join this cause. Kindly share us your experiences. My views about the event at Manila Zoo yesterday were able to see that the blind children learned how to socialize with the people around them. Maaring ma-enhance din ang kanilang pandinig at pandama sa mga wild and exotic animals such as tiger, lion, elephant, boar snake, tortoise, crocodile, birds etc. I’ve also noticed that parents gave importance and support to their children not to be aloof to the people they have socialized with at the zoo. 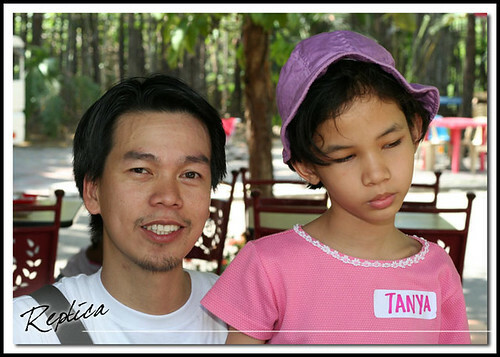 That was my very first time I took the pictures of the blind children with the animals. There was a time it’s hard for me to shoot them because gusto ko hanggat maari they’re holding the animals such as bird and some others. But other children are afraid to touch them, that’s the reason why I could not get a good shot. Other children were giggling and laughing while riding a horse and they really enjoyed it. I just called them by their names so that I could get their attentions and after a while told them to smile because I’ve noticed some of them are bowing their heads and don’t look to smart o maaring mahiyain lang sila. Nakita ko, bakas sa mukha ng mga magulang yung higit na kaligayahan dahil sa kasiyahan na nakikita nila sa kanilang mga anak. 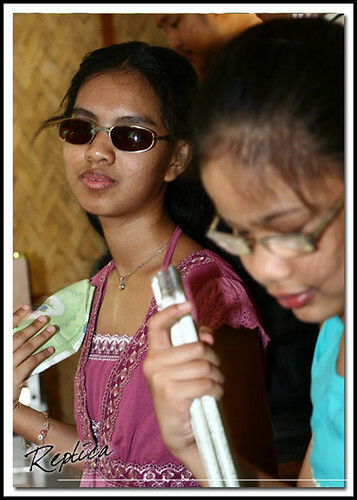 The first time I shot a picture of a blind girl, I felt a little pain in my heart and almost shed a tears dahil naisip ko; “sayang hindi nya makita ang ganda ng paligid” and at the same time naisip ko rin na mapapalad kaming mga photographers na nandon na may mga paningin. I enjoyed so much being with them even in just a short period of time. They really made glad because I saw them happy and satisfied kahit nahahawakan at naririnig lang nila ang mga hayop kahit hindi nila nakikita yon. Just like the little girl named Tanya yung na assiagn sa akin, she was enjoying to feel the movement of the hanging bridge pati na rin sa duyan kung saan gustong gusto nya mag-swing. When I captured their jolly faces nobody could say that they are blind because they look like normal children as they walk, step down the stairs and can eat by themselves even they don’t have eyesight. I feel pity on them because of their conditions. As a photographer I used my eyes to see the subject through the camera’s viewfinder and to think that those children could not be able to see the things around us… It really made me feel sad. 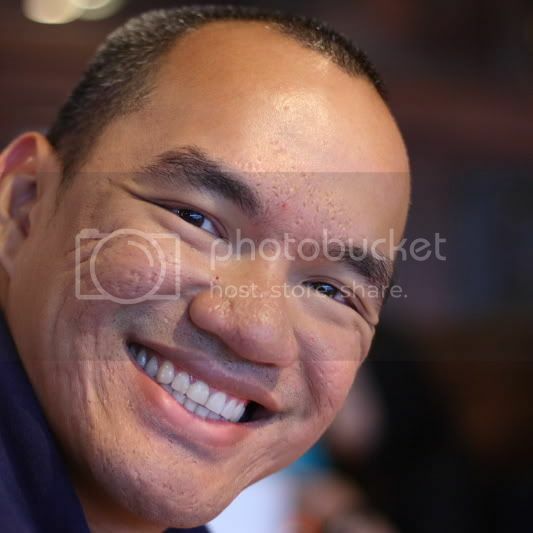 As a photo shooter there are times that a camera needed to be focused on the eyes of the subject and make sure na ma-capture ang masaya at nagniningning ang mata bago I-shot. gusto ko rin po mag iwan ng alala sa mga magulang, tuwing makikita nila ang mga masayang araw na ito. maaring makalimutan nila tayo, ngunit hindi ang litrato. Let me just transfer here what I said in John's thread. I'm just new to photography so I'm grabbing as much photo opportunity as much as I can. What's good about this is that the photo opportunity also becomes an outreach program. We're fortunate enough that we can see and do photography. So what I plan to capture is how these children are able to see the world without eyes. Here we discuss about sRGB, histograms, color balances, etc. These kids, they see through touch, which is the most powerful of the 5 senses. Capturing the power of touch through photography is the big challenge. It was a special day, different from the usual photo ops that most photographers take on. There were 18 blind children at the zoo and 15+ photographers. As Mr. John Chua as said, "This is not a photo contest." Yes, it's not. Instead, it's a personal challenge to photographers." It was a challenge for photographers to capture these moments, not only for these children and their parents, but also for our own personal growth. We've taken a lot of things for granted in our lives. .. We should be grateful that we have eyes to see the world and to enjoy our hobby. These children could only understand what we see through touch. .. We fear so many things. These children fear touching a harmless bird. So what are we really afraid of? .. We don't easily trust people and yet Malen trusted me even if we just met that day. She held my hand as we walked and touched the animals. She trusted me when I carried her to ride the ostrich. .. We have so many possessions, talents, loved ones.. let's take care of them..
.. Let's not forget to enjoy our lives! Thanks to everybody, especially to our new friends. these shots are very inspiring and heartfelt. it proves that PiPHO community if not just a bunch of talented photographers but people with a heart of gold. hope we can have more of this in the near future. * Some encouragement for Albert. This during the first opportunity for them to interact with the animals, as the miniature horse is introduced to them. * So admirable to see Miss Kathy in person, her dedication to contribute to a good cause, after reading much about her countless volunteer-isms. * Jason, the Blind Boy Wonder delighting Magiceye! * I like Keana's sun glasses, she looks like a super-heroine to me. * The person on the right is Thotie, Edelyn's guardian. When I was with them early on, I asked if she was Edelyn's, uhmm... mom, or tita. She didn't answer but told me just call her "Toti"... then I replied, "Toti? Oh so your are Edelyn's TITO!" Thankfully she laughed too, I felt so silly. * Here's Lloyd with Albert. Lloyd is new to pipho and actually just came home from abroad. I think he bonded well with his little brother. * I had this printed 8X10 over at the Canon booth, and handed it over to Czarina, Camille and their mom Brenda, along with the six 4X6 prints. I think they love it. I wish I could have printed more, but I forgot that I was shooting two kids and that I'm entitled to two sets of prints. Sayang 'yung other set, Canon prints are amazing! I'm sending the family the rest of the prints soon, but I'm now torn if I should have it printed at the lab or buy a Canon printer and papers instead... hmmmmm. * Lastly, an image of the doting mom with her beloved child. I never could fathom the pain they could be enduring. I learned from Brenda that both Camille and Czarinah had partial vision before. Czarinah could even recall an earlier visit at the zoo, she was much younger then but there's visual memory. Camille, on the other hand, got sick when she was young and her sight totally left her as a result. I wondered to myself what could be more painful: to have a child born blind or to have both children lose their eyesight growing? But then again, I really had no time to feel sadness because they themselves don't show it. Their affection and appreciation for one another made it truly a lovely day. I thought it was funny when at one time, Czarinah was just standing still, looking mataray and her mom approached her hurriedly. She said Czarinah texted her with "san ka na. lagot ka pagdating mo dito" . I asked Brenda why they aren't using canes like the other children who could actually navigate around adeptly with it. She said it's because her children are lazy and wouldn't want to train... and that they have her anyway. My hats off to you, parents. On the photography aspect, it was a great exercise as all shots are impromptu. In landscape, your subject is not moving and you can set your camera to a perfect setting. It's almost shooting sport, except that there is no clock-timer that somehow gives you a little idea on when the winning shots are coming. It's also like weddings, except that people here aren't exactly made up by top cosmetic artists. I fumbled a lot on how to meter every scene until I decided to just use spot and just expose for the faces - screw the background! And of course, I doubt if anybody had a chance to do post-processing when it's time choose the best images for printing, photoshop's not a friend that day. To top it all, I didn't notice that my CPL is still attached to the lens as we were shooting landscapes the day before... so that's why I always seem to be getting shutter speeds at least 2 stops down at direct sunlight with my aperture wide open! How silly! On personal level, the whole experience is simply priceless. I'll have good memories of this day. Page created in 2.822 seconds with 53 queries.